An agricultural watchtower photographed in the last century (ca. 1900-1920). Note the stair on the near side with a seated man near the top, the brush covered turret, and the arched doors leading into enclosed rooms beneath. Image from here. Migdal ‘Eder is a transliteration of the Semitic phrase for “fort of the flock.” Such “forts” or “towers” arise here and there in the biblical text. A migdol (possibly a metathesis of the Akkadian madgaltu, “watchtower” or “border post” suggests W. F. Albright) may be found perched on a wall, squatting down on a hill, or reaching up to the sky. According to the literature, some seem to be small agricultural installations (Isa 5:2; cf. the pyrgos of Matt 21:33) while others are dense citadels (Ps 64:3 ) or even Babelesque skyscrapers (Gen 11:4)! However presented, the migdal offers its inhabitants a place of refuge, splendor, and vantage. It is curious stuff. Here is another old photograph, showing, as the Hebrew caption suggests, “A Watchtower from the hills of Samaria.” I believe I scanned this image from S. Hirsch’s 1933 volume titled Sheep and Goats in Palestine (Palestine Economic Society, Tel Aviv). Remains of these dry-stacked stone structures may still be seen in rural Palestine. Local Arab speakers call them qusoor or “palaces.” They often appear as rock piles in terraced fields. I’ve encountered many of these while wandering afoot, but nowhere as numerous as in the hills around Bethlehem. Sidenote: a well-illustrated report on the cultural landscape of this area has been recently prepared (2013) by the Ministry of Tourism and Antiquities and the Department of Antiquities and Cultural Heritage of Palestine. Colored maps detail local landuse as well as the presence of these towers. I’ve lifted and linked two illustrations from the report here. The first shows the basic types of structures encountered. The second maps the presence of these structures on the ground. Oddly enough, it seems that a history of the migdal or qusoor has yet to written. Some scholars date these installations all the way back to late-prehistory (9th-4th millennium BC)! Others are more recent, perhaps Iron Age or Ottoman in origin. Whatever the case, these have been used as shelters right up to present time. For the full report, click here. Plans and elevations of tower types in the area immediately west of Bethlehem. I culled the graphics from here and rearranged them slightly for our use. A map illustrating the distribution of agricultural towers near the Palestinian village of Battir. Note the “sprinkles” of squares on the right hand side of the orange colored area. These are documented towers. The red dot in the center of the map is Battir. The village of Bayt Jala is located on the right edge. Bethlehem (Beyt-lahem) is just off the map to the east, Jerusalem is just off the map to the north. From here. The view to some of the remains at Magdala. One wonders if the site gained its name from a literal tower, or if it was simply a “splendid” place? 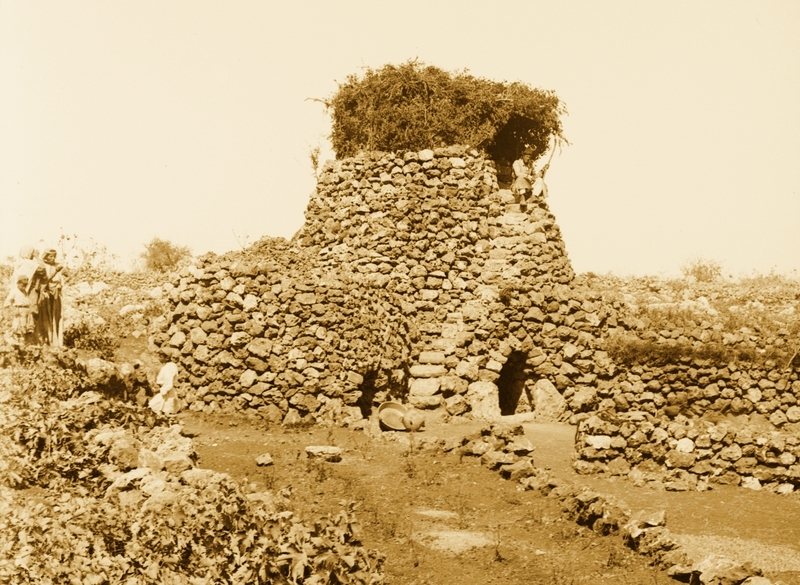 One suggestion is that there was a tower in Magdala for drying fish, as the site was a regional center for processing catches from the Sea of Galilee. I recently visited the place and shot this image of a flag flying from from an impressive (and ancient) water tower. If migdal represents the “Fort” of our “Flock Fort” title, the Hebrew term ’eder gives us the “flock” part. This term represents a “herd” of animals. Sheep and goat quickly come to mind, but the biblical ‘eder may also include donkeys, cows, and camels. Jacob drives a thundering menagerie through the middle of the text of Genesis. Eventually he slows down and must sheepishly (!) face Esau (Gen 32:14-15). Apart from Josh 15:21 (where Y. Aharoni suggested that ‘eder may simply be a corrupted representation of ‘Arad), the use of ‘eder as a place-name is limited to two instances: Gen 35:21 and Micah 4:8. Both texts muster the complete phrase: Migdal Eder. It is tempting to suggest that there is some intertextual “energy” bouncing between them. Should Micah be read in light of Genesis? Are both being reimagined by the Gospel of Luke? Can any of this data be backfed into the Christmas story? These are the kinds of things I wonder while walking through Bayt Sahour. The structures at Nazareth Village, Nazareth, include a model of an agricultural migdal, qusoor, or “watchtower.” Our groups always enjoy this stop. Photo by Matt Wickham from a 2010 CCU Study Tour.